SKU: 5891. Category: Women's Dresses. 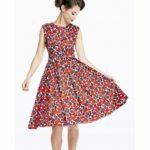 Betty Tropical Floral Swing Dress is an ideal tropical-inspired party dress. She has a chic V-neck with delicate collar inspired detail, adjustable slim shoulder straps, and figure hugging princess seams on her navy satin bodice. 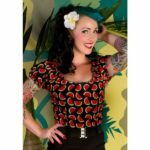 Her full skirt is box pleated into the top, made in a crisp, fantastic tropical flower and leaf design, in red and grey on a navy background.